Christmas cards feature lovely images that evoke holiday spirit and warmth. After receiving them and storing them away, however, you can find yourself with a stack of greeting cards from years gone by. 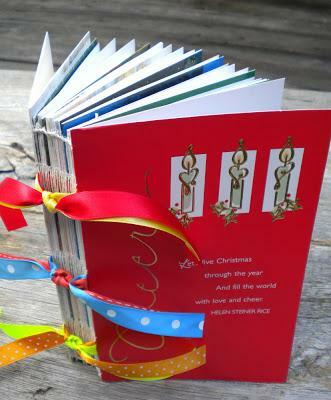 Repurpose your old Christmas cards to make new items that you'll treasure year after year. Gather up those old cards and make decorative items that will remind you of the warm holiday greetings you've received from loved ones. 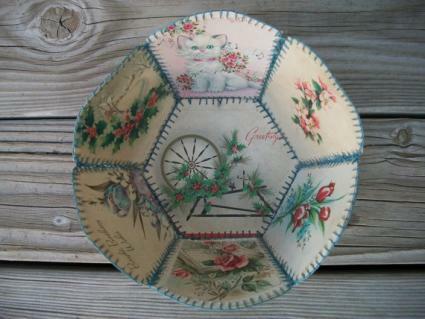 What could be more appropriate for your used Christmas cards than a basket to hold new ones? Here's how to put it together. Cut the fronts of two cards into a hexagon with 3" sides to create the base of the basket. Cut 12 additional card fronts into 3" by 6" rectangles. Line up and glue the two hexagonal pieces together with the patterned sides facing out. Glue pairs of rectangles together with patterned sides facing out, so you end up with six rectangle pieces. Allow the glue to dry. Trim the top of each rectangle (one of the 3" sides) into a scalloped shape. Make a blanket stitch around the edge of each piece. Sew the bottoms of the rectangle pieces to the sides of the hexagon, then pull up the rectangles and sew their long sides together. 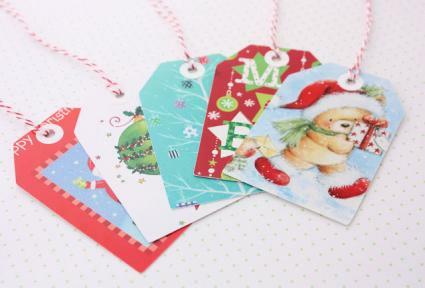 Because they already have a Christmas theme, old cards make excellent gift tags with only slight modifications. Cut the back off of the greeting card and discard it. Look at the front and determine which part of the image would make an attractive tag. Cut out this part of the image and use a single hole punch to make one hole in the top or side. Feed a 6" length of ribbon through the hole and knot the two ends together. 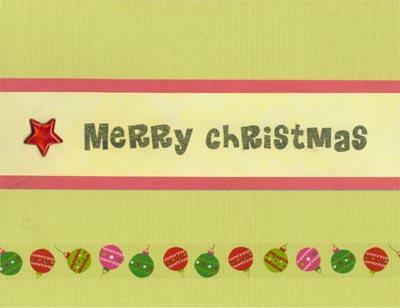 Note that it is possible to make several tags out of a larger Christmas card. 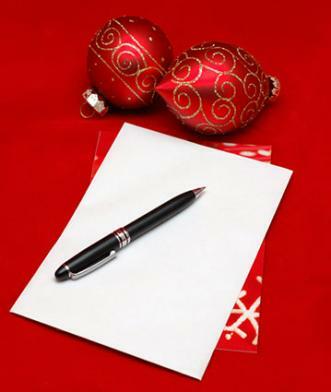 Christmas cards can be used a second time to send holiday greetings if made into postcards. People using this idea should be sure they don't send a card back to the person they got it from the previous year, however. Cut the front of any Christmas card into 4" by 6" size. Turn the piece sideways and write a message on the back of it. Add a standard postcard stamp and mail. Some Christmas cards do not make for good postcards. This includes those printed on very heavy stock or that are heavily embellished with glitter or other items that can come loose in the mail. Create unique tree ornaments will old Christmas cards and a few other basic supplies. Cut the front of six Christmas cards into square shapes of exactly the same size. Use a hot glue gun to attach them all together at the edges, forming a cube. Turn the cube so that one of the corners is facing upwards. Glue a loop of ribbon to the tip of this cube so the ornament can be hung on the tree. Another great way to recycle old Christmas cards is to use them to decorate your holiday table. When your friends and family come over to visit, they'll have a blast trying to pick out their cards from your designs. Cut the poster board down to the size you want your placemat to be. Trim and arrange the cards so they fit to the size of the mat. 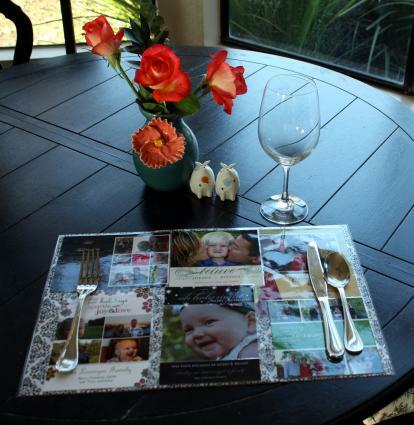 Laminate the finished placemats so they can be wiped off and reused. For many people, Christmas brings to mind images of family dinners and delicious holiday treats. Use your leftover Christmas cards to make a homemade recipe book. Cut the front part of your cards down to 4x6 rectangles. Neatly print your favorite recipes on the back side. Punch two holes on the side of each card, one near the top and one near the bottom. Tie the cards together into a book with the ribbon. Use the cards to decoupage large wooden letters to spell JOY, NOEL or another popular holiday saying. Cut the cards down into small pieces. Spread a thin layer of Modge Podge over the wooden letters. Press the pieces of the cards onto the letters, smoothing them into place with the popsicle stick. Make sure to cover the edges and sides as well. Allow to dry, then spread a second layer of Modge Podge on top of the cards. If you can't stand the thought of throwing away the thoughtful cards you receive for the holidays, consider turning them into decorations and other useful items with one of these crafts. The people who send you cards each year may be thrilled to find out how you've preserved their Christmas greetings to be enjoyed for years to come.